Like china from Alice's tea party, each whimsical mug is sure to bring imagination with every sip. 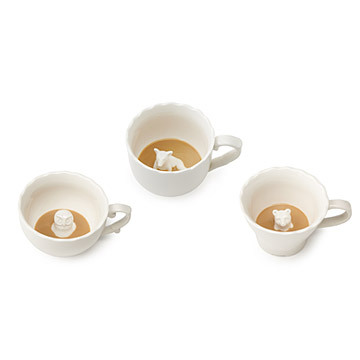 Keep tea parties full of surprises with these extra-roomy ceramic mugs sculpted with owl, fox and bear figurines inside each cup. Like china from Alice's tea party, each whimsical piece is sure to bring imagination with every sip. Drink up to reveal your hidden animal! Designed by Angeline Tetrault. Made in China. Ange-line Tetrault is a product designer working in Toronto, Canada. She graduated from OCAD University with a degree in Industrial Design and is currently working at imm-Living. Her work has been featured in publications including, At Home With Rachel Ray, Elle Decor and Frankie Magazine. With a background in the theatre and an interest in setting the scene, as it were, Ange-line believes that objects not only tell a story, but also become pieces of history once created and claimed. She finds nature and popular culture equally fascinating and her passion for the two results in works that are playful, thoughtful and reflective. Excellent Fox mug! So pretty and big! This is such a unique gift. I was looking for something cute and small for my boyfriends sister and these are perfect. The cups themselves are very large too. I would buy these for myself/any coffee or tea drinking friend! Overall, this product is great. I got it for my friend for my birthday and she loves to use it for tea. Also, the gift box was amazing! I got this as a gift for my younger sister. She's a sucker for coffee and cute animals. She was so proud of it, that she brought it into work to show all her fellow employees. It is bigger than we expected (all the better for more coffee), and it's holding up well so far. I bought this for my sister-in-law for her birthday. She loved it! The cup is larger than I thought. It looks delicate and fancy enough to show off as a display piece, but sturdy enough to use everyday. Very cute! I am so excited to give this mug to my friend for Christmas! I was surprised at the large size. It is high quality, quirky twist on an every day coffee mug! I love this. Sent it as a gift to friends and kept one for myself. Everyone thinks the little fox hiding in the mug is adorable. Like everyone says, the mug is very large, but I think it is perfect for those of us who love abundance. Perfect choice. I bought this for my wife as she loves unique mugs. She will love it!